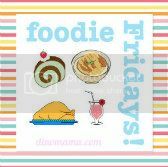 Right, I think all of you are getting tired of all my no bake cheesecake posts on Foodie Fridays, I told myself that I should stop it BUT when I was browsing the net for cheesecake recipes earlier I chanced upon Angela Chia's blog and her Banana Custard Cheesecake. 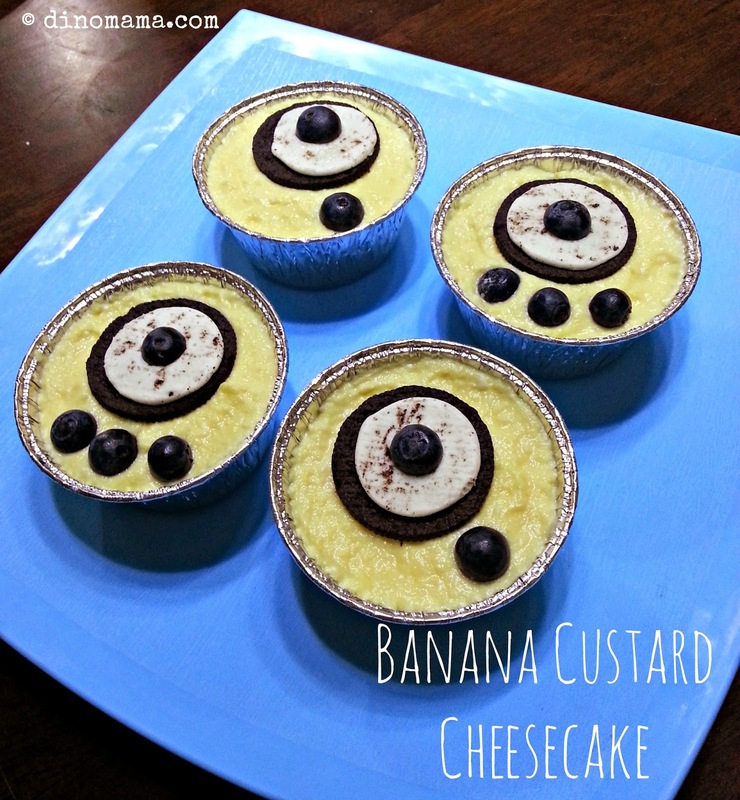 It is NOT just another custard cheesecake, its MINION BANANA CUSTARD CHEESESCAKE!!!! 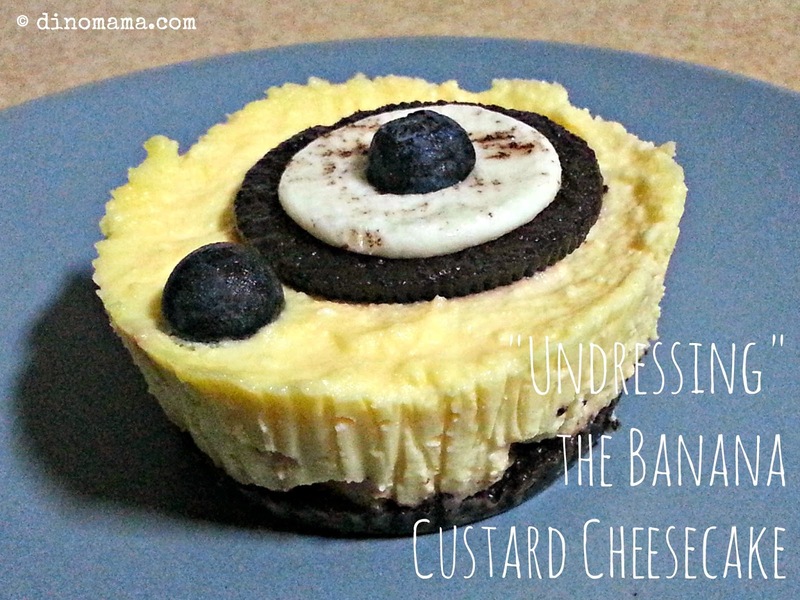 I am not a HUGE minion fan but DinoBoy is and I know he will love these cheesecakes. Look at them, aren't they cute and adorable? Ok, they look different from Angela's because my aluminion cups are too small so there were not enough space to add in the "eyelashes" but they still look like minions. 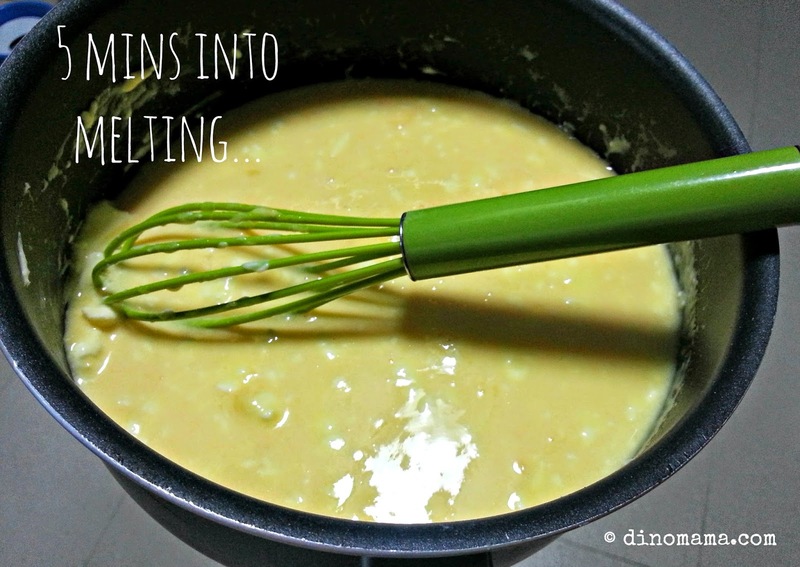 This recipe calls for all the ingredients to be melted in a pot using low heat, something different from the cheesecakes I made for the past weeks. 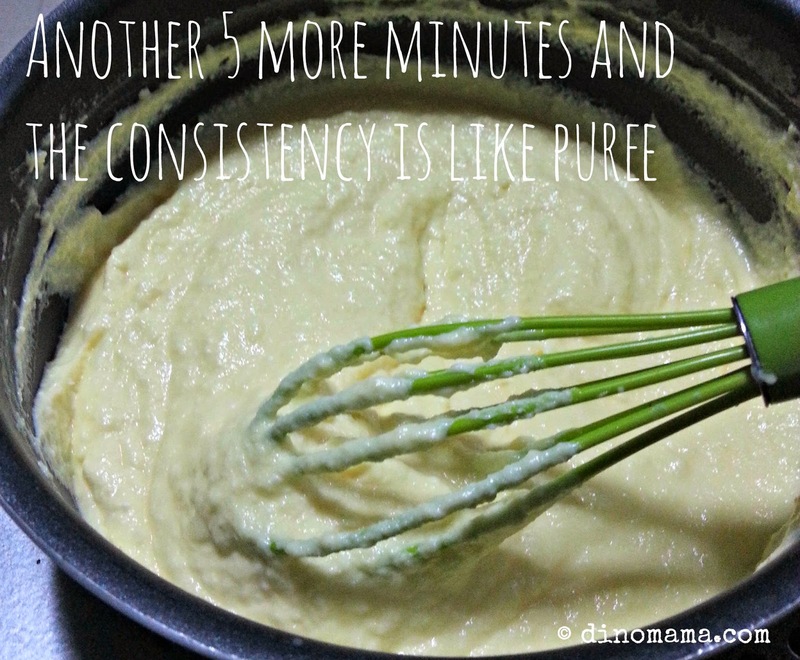 It took me aboutn 10mins to stir the mixture on low heat till its puree liked. I let the puree custard mixture cool down for a bit even though the original recipe did not say to do so, I just thought that the hot mixture would probably melt or soften the frozen set base if I pour it into the cup. And Angela is right, Oreo cookies, banana and custard ARE such perfect combination! If I were to make these again I will put in pieces of bananas instead of dicing them up. On another note, if you are looking for cheesecake texture, this is not for you as the custard taste is stronger then the cream cheese, thus the name Custard Cheesecake. Plus even after 4 hours or more chilling the cake is mushy, not firm like a cheesecake. If you are a banana and custard lover you will fall in love with this cheesecake. 1. Put the digestive biscuits into a ziplock bag and crush them either using a rolling pin or anything hard enough to do the job easily. Set aside. 2. Melt the butter using the microwave on medium high heat for a minute or till melted or using the double boiling method. Set aside to allow it to cool down. 3. Add the cooled down melted butter into the crushed digestive biscuits. Mix well by shaking the bag. 4. Empty the mixed contents onto a 7" springfoam pan or cake ring. Use the back of a spoon or spatula to smooth out the mixture and press it down. 5. Put it into the freezer to set for about 30mins while you prepare the cream cheese. 6. 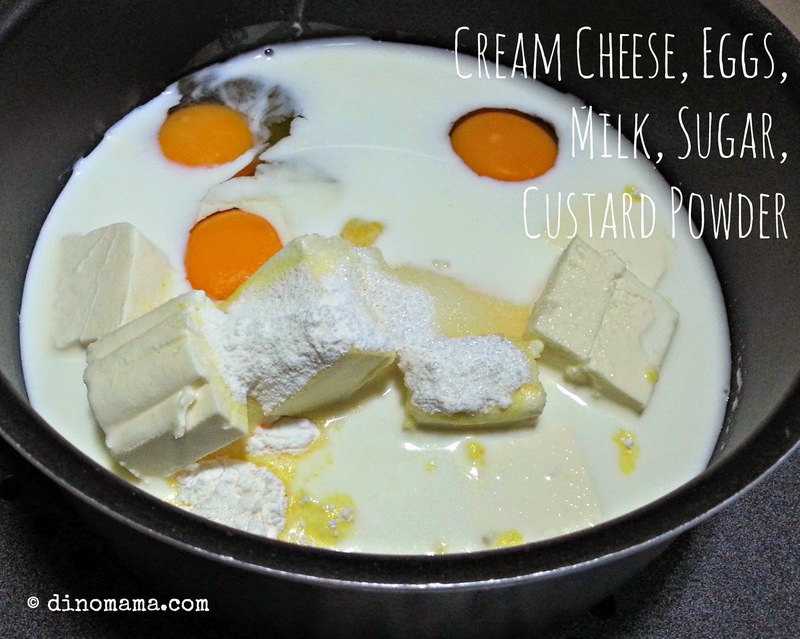 Combine cheese, milk, eggs, sugar and custard powder in a pot and cook at low heat. Stir constantly using a balloon whisk until the mixture thickened. ** Please be patience. The mixture will thicken to the consistency of baby cereal/puree. 9. Dust with cocoa powder if desire to enhance the flavour and cut to serve. This is something I may try!